Sleeping during the day can change your life! We still don’t know exactly why we sleep, but we do know we need a lot of it. Prisoners of war are often tortured by sleep deprivation. As are parents of newborns. The best explanation we have for our regular trips into unconsciousness is that it is a time when the brain runs its anti-virus software and reboots, re-calibrates its neural networks. In short, sleep serves to maintain the integrity of our operating software AND hardware: the central nervous system. More studies are emerging showing the very helpful nature of sleeping during the day. Increased mental acuity, immune function, pain management and long term mental health are being related to daytime naps. And it appears a catnap won’t do the trick as well as a full blown siesta (although deep relaxation or cat naps are superior to no naps). In fact, functional MRI studies have even shown that 27 minutes of deep relaxation every day can change the density of certain areas of the brain. These changes coincided with improvements in anxiety in the control groups. We have 5 stages of sleep. Stages 1 through 4 and the mecca of all sleep journeys, REM. It takes 90 to 120 minutes to run through the whole 5 stage cycle. After which the body starts back at Stage 1 and repeats the process until we awake. Emerging conventional view on daily naps is that 90 minutes is a great idea. This allows one series of the full sleep cycle to occur. Practically speaking, most of this article’s readers won’t be able to fit an hour and a half nap in. But you should do so as often as you can. For those who’ll have to settle for 10-15 minutes of deep breathing in a relaxing place, the timing of the nap (or deep relaxation session) is the next most important goal. Depending on when you go to bed, you should nap at a strategic time of the day. As a rule of thumb, you should nap 6 to 7 hours after awaking in the morning. 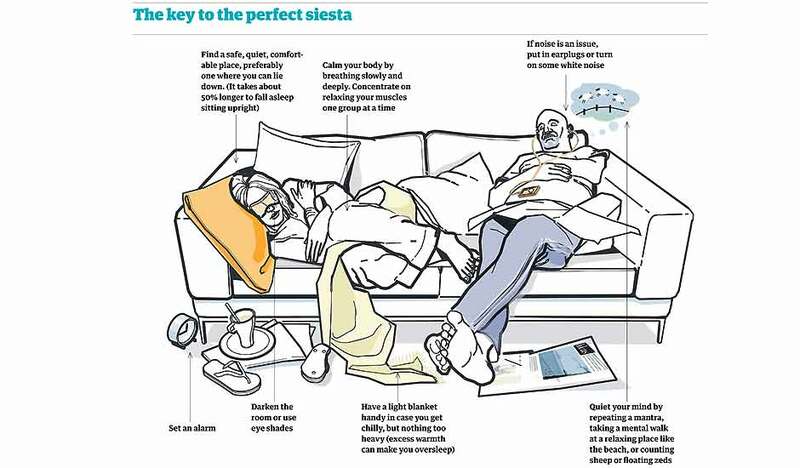 The following diagrams are from this article on nap time from the Guardian online magazine. We have two natural “super sleepy” times during the day: between 2 and 4 AM and 1 and 3 PM. So, as you see, if you’re early to bed you should nap around 1 PM. And if you’re a night owl, nap no later than 2. Because if you nap later than the 1 to 3 PM sleep zone, you’ll have too much trouble falling asleep that evening. And if you nap too early in the day, you’ll have trouble achieving proper sleep and will be too tired by bed time. There is only a growing body of evidence in support of the total health benefits of mid day relaxation and naps. This is a health habit we can all get used to! One of the things modern society has abandoned is it’s use of sleep to heal physical and psychological wear and tear. Firstly, with artificial lighting, we go to bed far too late. We also stare directly at light sources (e.g. 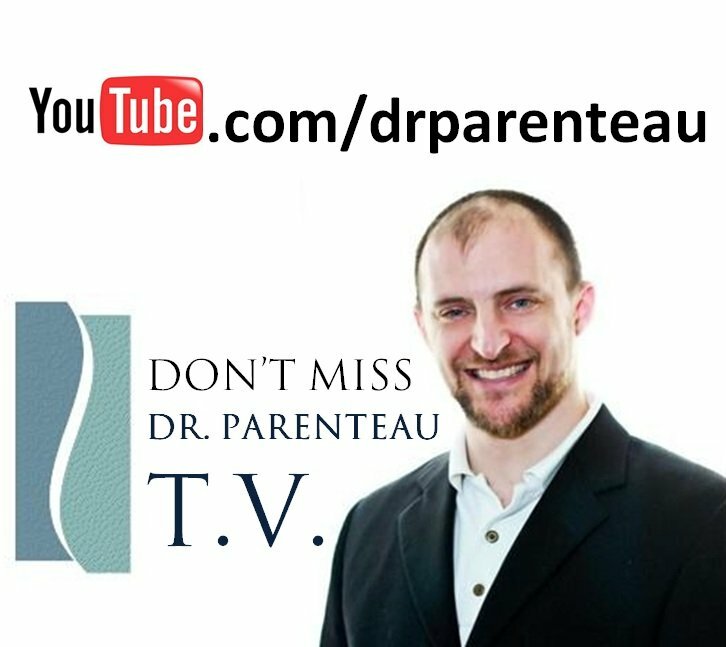 : televisions, computer screens, video games, tablets, smart phones, etc) which fools our brains into thinking we are still in daylight hours. This confuses our circadian rhythm and spikes our adrenaline and cortisol releases which keeps the body from truly winding down. Second, we ingest high sugar snacks after super, firing up our brains — which feed primarily on sugar — and again, fooling the body into thinking we want it revved up. Even with decades of sleep studies under our belt, we still don’t know exactly why we sleep. However, we do know the effects of too little sleep. Emotions take the most direct hit. And then mental ability. The last and least affected is our physical prowess. Tests have shown that sleep deprivation on young subjects decreased their moods and mental abilities but not their VO2 max tests. However, lack of sleep will eventually curb physical recovery as well. By studying historical documents, historian A. Roger Ekirch has proposed that in the pre-industrial (i.e. : prior to house hold electricity), going all the way back to the middle ages, people not only went to sleep at sundown, but awoke for about an hour in the “mid” night — around 1 to 2 A.M. This was commonly practiced and was seen as a time of uninterrupted and clear minded reflection, relaxation and contemplation. This “mid-night” wakefulness was then followed by sleep for several more hours. Lack of sleep has been shown to increase cortisol levels which decreases testosterone. Bad news for men. Especially middle aged men. By pooling all of the evidence surrounding sleep studies, the main concept we’ve discovered is that sleep is nature’s “virus protection software.” It is the time when the mind takes out unnecessary information and organizes thoughts and emotions into neatly ordered and classified orders. Parents of newborns can atest to the preciousness of sleep as they most often go without it for the first time in their lives. And seeing as we do it a full one third of our lives, it is clearly a vital part of our health. It is this single activity which our bodies demand we perform more than any other single duty in our lives. Yet modern society is chronically under rested. Day-time laziness does not make up for poor night time sleep. In fact, it perpetuates bad sleep and promotes unproductive behaviour. Sleep medication is one of the most often prescribed item in our day and age. Yet sleep is available to all of us without pharmaceuticals. There is no problem in temporarily using sleep meds, but the goal should be to overcome sleep issues by following the simple rules of biology. For those in noisy apartments or who live with others, a “white noise” maker and ear plugs can help block out noise. And remember, the best way to fight off sleep is to try too hard to fall asleep. Your job is NOT to fall asleep, but to follow the above rules and then rest your body. Sleep will come all by itself. We are chronically overworked and under rested. As a consequences we’ve seen a rise in anxiety disorders and sleep problems. Both of which are purely the result of too much stress and not enough true rest. Build fun into each day. Grown ups should have a healthy dosage of an “inner child” and allow themselves to have fun. Wind down properly at night, stop caring about what other people think, remember that your self worth has nothing to do with how much money you make or how thin you are, and treat yourself to a good night’s sleep! P.S. the body loves routine and is built to follow it. Go to bed at the same time every night. If you’ve had troubles sleeping in the past, don’t expect miracles to happen overnight. You’ll probably struggle for some time. But eventually, your body will fall in line. It is designed to. I recommend you also purchase an appropriately sized memory foam pillow from therapeutica.com.